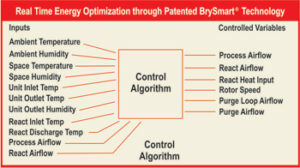 The new, Bry-Air BrySmart® Series (BBS) Dehumidifiers is embedded with patented* BrySmart® and BryThermTM technologies. The latest product offering from Bry-Air is designed for continuously optimizing Dynamic Specific Performance (DSP) and incorporates BHPTM (Bry-Air High Performance) rotor with special geometry and chemistry. Most advanced tool for predictive failure/maintenance…the new world order for continuously diagnosing and forecasting components failure e.g. 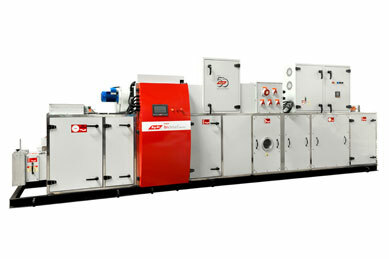 heater, drivers, switchgears, etc. The BBS modulates various critical components to optimize the energy consumption on a continuous basis. This technology is a step forward in energy conservation through enhanced automation (on real time). The BBS uses Variable Frequency Drives (VFDs) on various motors, thyristor control for heaters and also includes mobile connectivity for sensor monitoring, controlling and data logging. 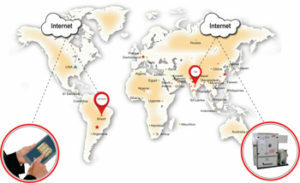 Contact the Bry-AirAirgineersTM at bryairmarketing@pahwa.com for a solution to your humidity/moisture problems. Welcome to the Knowledge Center!A precious resource for AirgineeringTM related information.Over the half century, Bry-Air has developed a vast understanding of adsorptions, and adsorption-based technologies about air and its industrial interface.The knowledge and experience gained are continuously used in helping customers achieving their business goals –Profitability Productivity and Sustainability.Bry-Air helps the world renowned companies to solve critical airgineering challenges across the globe.Here are a few selective links to a vast repository of knowledge for your reference and usage.